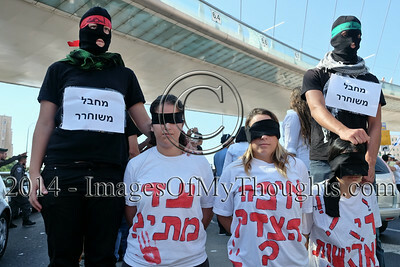 Protesters dress up as Hamas terrorists, allegedly responsible for the kidnapping and murder of three Israeli teens. 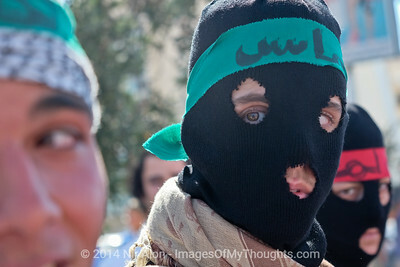 Hundreds of right wing Jewish protesters marched through Jerusalem calling for revenge and shouting "Death to Arabs" following the murder of three Israeli teens kidnapped in the West Bank and whose bodies were found near Hebron. 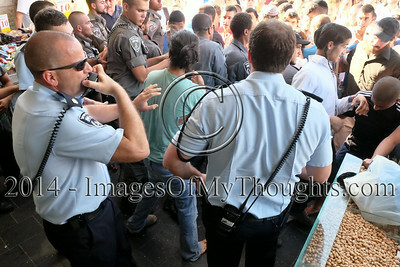 Protesters clash with police in an attempt to release their fellow detainees. Hundreds of right wing Jewish protesters marched through Jerusalem calling for revenge and shouting "Death to Arabs" following the murder of three Israeli teens kidnapped in the West Bank and whose bodies were found near Hebron. 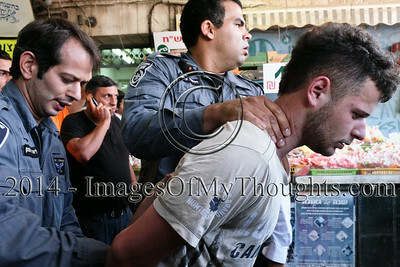 Police make arrests and prevent access to the Mahane Yehuda Market where protesters attempt to hunt out Arab workers for revenge. Hundreds of right wing Jewish protesters marched through Jerusalem calling for revenge and shouting "Death to Arabs" following the murder of three Israeli teens kidnapped in the West Bank and whose bodies were found near Hebron. 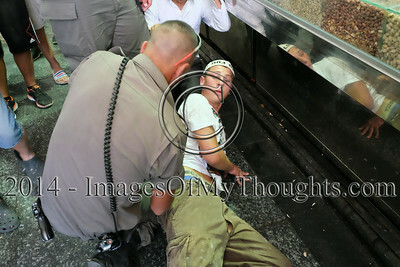 Border policemen use force and make arrests to disperse protesters at the Kikar Tzahal Square. 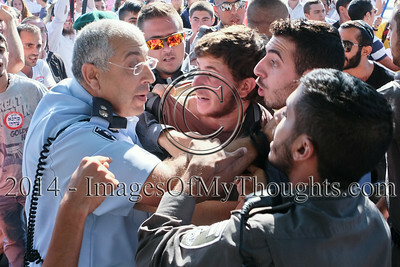 Hundreds of right wing Jewish protesters marched through Jerusalem calling for revenge and shouting "Death to Arabs" following the murder of three Israeli teens kidnapped in the West Bank and whose bodies were found near Hebron. 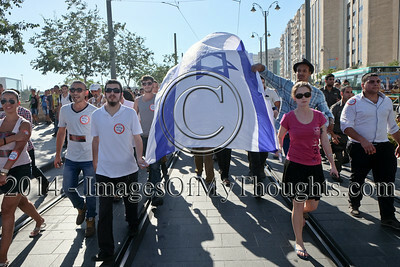 Protesters block traffic at the main entrance to the capital beneath the Calatrava Chords Bridge. 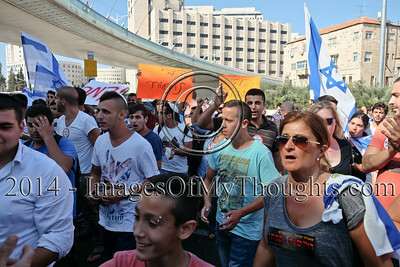 Hundreds of right wing Jewish protesters marched through Jerusalem calling for revenge and shouting "Death to Arabs" following the murder of three Israeli teens kidnapped in the West Bank and whose bodies were found near Hebron. 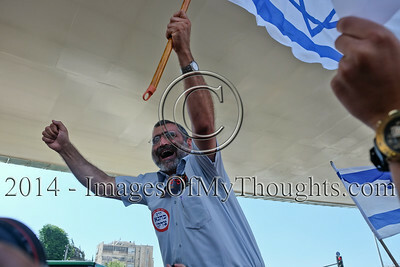 Extreme right wing activist MICHAEL BEN-ARI expresses his rage. 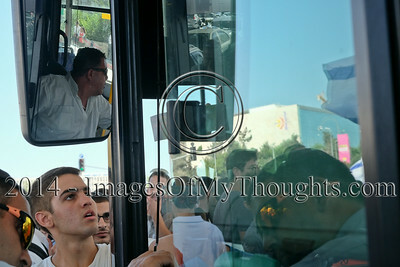 Hundreds of right wing Jewish protesters marched through Jerusalem calling for revenge and shouting "Death to Arabs" following the murder of three Israeli teens kidnapped in the West Bank and whose bodies were found near Hebron. 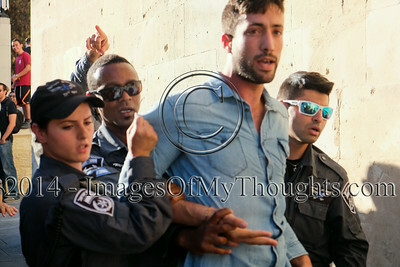 Police detain a protester as hundreds of right wing Jewish protesters marched through Jerusalem calling for revenge and shouting "Death to Arabs" following the murder of three Israeli teens kidnapped in the West Bank and whose bodies were found near Hebron. 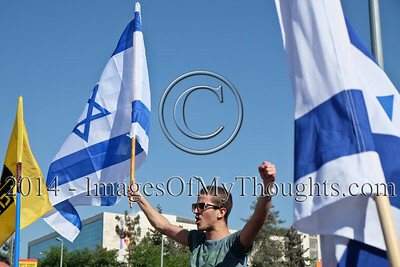 Hundreds of right wing Jewish protesters marched through Jerusalem calling for revenge and shouting "Death to Arabs" following the murder of three Israeli teens kidnapped in the West Bank and whose bodies were found near Hebron. 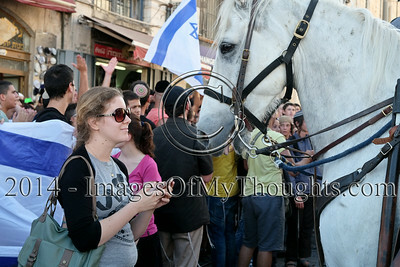 A female protester interacts with a police horse brought in for riot control. 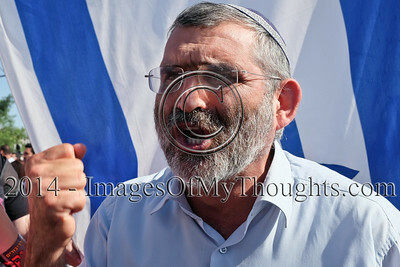 Hundreds of right wing Jewish protesters marched through Jerusalem calling for revenge and shouting "Death to Arabs" following the murder of three Israeli teens kidnapped in the West Bank and whose bodies were found near Hebron. 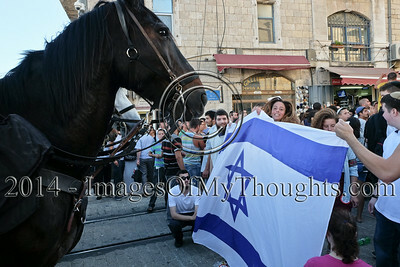 Protesters refusing to disperse hold up an Israeli flag to stop police riot control horses. 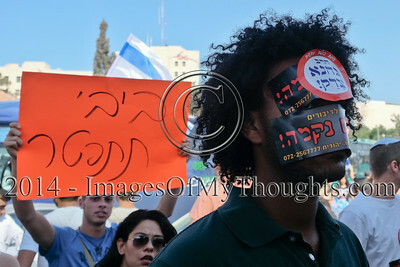 Hundreds of right wing Jewish protesters marched through Jerusalem calling for revenge and shouting "Death to Arabs" following the murder of three Israeli teens kidnapped in the West Bank and whose bodies were found near Hebron. 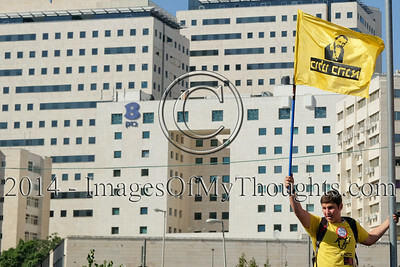 A boy waves a yellow flag declaring Kahane is our king (the late, extreme rightist, Rabbi Meir Kahane). 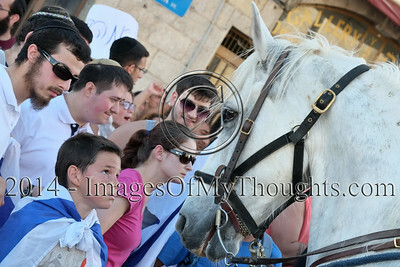 Hundreds of right wing Jewish protesters marched through Jerusalem calling for revenge and shouting "Death to Arabs" following the murder of three Israeli teens kidnapped in the West Bank and whose bodies were found near Hebron. 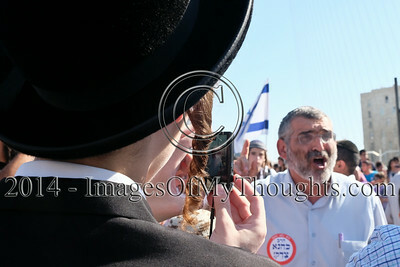 An ultra-Orthodox Jew takes a photo as extreme right wing activist MICHAEL BEN-ARI expresses his rage. 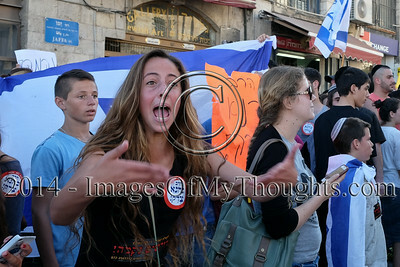 Hundreds of right wing Jewish protesters marched through Jerusalem calling for revenge and shouting "Death to Arabs" following the murder of three Israeli teens kidnapped in the West Bank and whose bodies were found near Hebron. 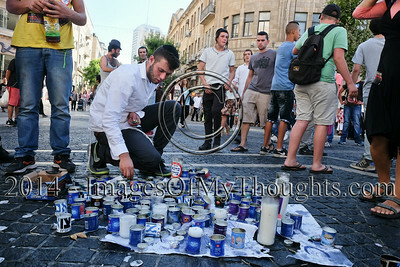 A young man lights one of many memorial candles at the Zion Square in downtown Jerusalem. 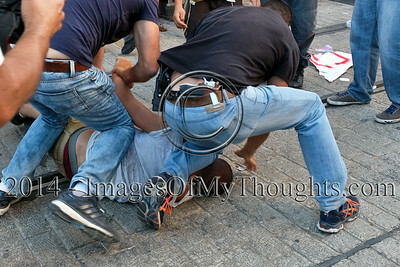 Hundreds of right wing Jewish protesters marched through Jerusalem calling for revenge and shouting "Death to Arabs" following the murder of three Israeli teens kidnapped in the West Bank and whose bodies were found near Hebron. 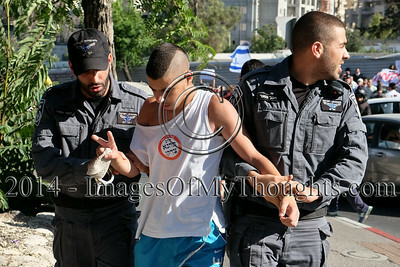 Police use force and make arrests to disperse protesters at the Kikar Tzahal Square. Hundreds of right wing Jewish protesters marched through Jerusalem calling for revenge and shouting "Death to Arabs" following the murder of three Israeli teens kidnapped in the West Bank and whose bodies were found near Hebron. 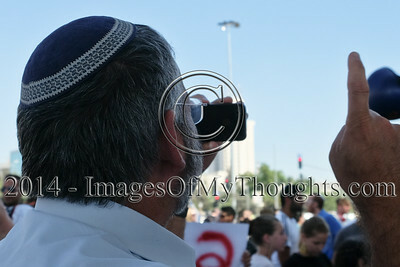 Extreme right wing activist MICHAEL BEN-ARI produces a video on his cell phone to share on social networks. Hundreds of right wing Jewish protesters marched through Jerusalem calling for revenge and shouting "Death to Arabs" following the murder of three Israeli teens kidnapped in the West Bank and whose bodies were found near Hebron. 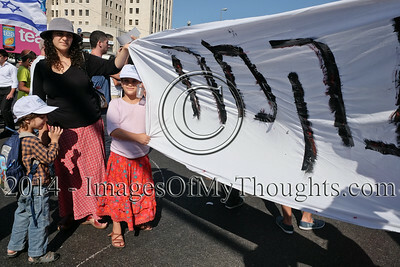 A family holds up a banner reading 'Revenge' in Hebrew. Hundreds of right wing Jewish protesters marched through Jerusalem calling for revenge and shouting "Death to Arabs" following the murder of three Israeli teens kidnapped in the West Bank and whose bodies were found near Hebron. 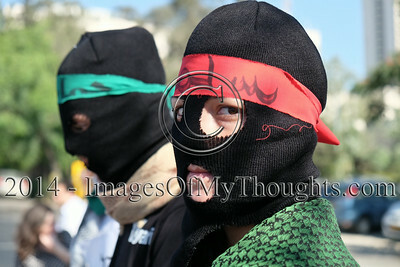 A young woman protests alleged police brutality as protesters refuse to disperse. Hundreds of right wing Jewish protesters marched through Jerusalem calling for revenge and shouting "Death to Arabs" following the murder of three Israeli teens kidnapped in the West Bank and whose bodies were found near Hebron. 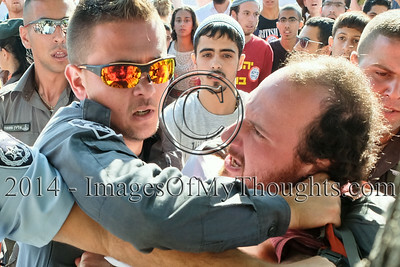 Undercover policemen use force and make arrests to disperse protesters at the Kikar Tzahal Square. 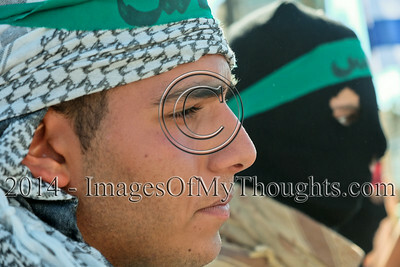 Hundreds of right wing Jewish protesters marched through Jerusalem calling for revenge and shouting "Death to Arabs" following the murder of three Israeli teens kidnapped in the West Bank and whose bodies were found near Hebron. 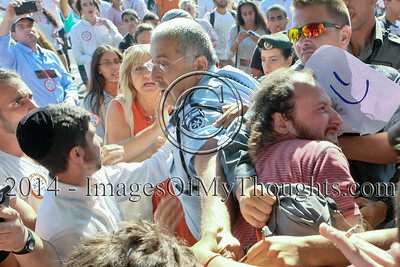 Extreme right wing activist MICHAEL BEN-ARI is carried on the shoulders of protesters as they cheer 'the next Israeli Prime Minister'. 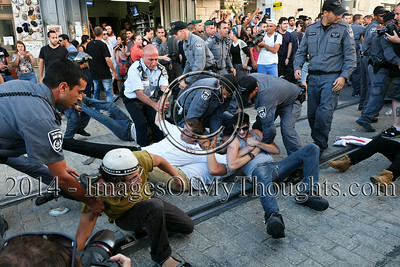 Hundreds of right wing Jewish protesters marched through Jerusalem calling for revenge and shouting "Death to Arabs" following the murder of three Israeli teens kidnapped in the West Bank and whose bodies were found near Hebron. 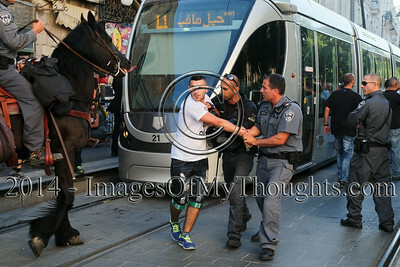 A young boy interacts with a police horse brought in for riot control. 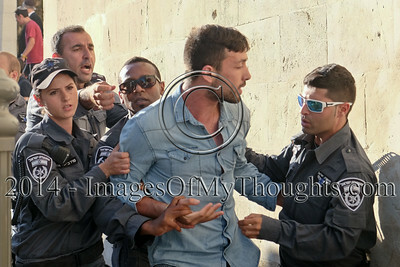 Hundreds of right wing Jewish protesters marched through Jerusalem calling for revenge and shouting "Death to Arabs" following the murder of three Israeli teens kidnapped in the West Bank and whose bodies were found near Hebron.